As a Tucson, Arizona Wedding Photographer, I am very blessed with a wonderful creative community. In this blog post, I feature photos from a styled shoot I recently attended. Photographers participate in styled shoots for a number of reasons; to learn new posing, practice lighting techniques, form relationships with other photographers and vendors, and to develop new promotional material. Sometimes, we do them because they're pretty and fun. JBridal Boutique loaned the wedding dress and pink and maroon bridemaid dresses for this shoot. I loved how simple and sweet this wedding dress was. Kerri and Brett modeled our bridal look. They've been married for years, but man, that newlywed glow was still so present. They were such a sweet couple and enjoyed my antics, which is always nice. I don't always let sunflares stay, but when I do, they're rainbows. One fun aspect of this shoot is that the bridal party were all friends and/or family. The female on the left was the groom's sister, and the best man was his best friend! How fun. Soiree Girls provided the floral arrangements for this shoot. They did such a great job! Heather Van Houten provided the hair and makeup. She did such a fabulous job. Each girl looked so elegant. The details in this shoot were careful thought out and created the perfect vibe for a classic soft elegant wedding. Elegant Farm Tables provided these tables. Peace of Mind Events provided the linens and many of the details on the tables. Norabella designs created the beautiful stationary set and menus. I especially loved the decorative envelope liner. Alia from Crumbs Cake Boutique absolutely knocked it out of the park with this feminene cake. Alia has been featured on my blog multiple times before, so check her out! 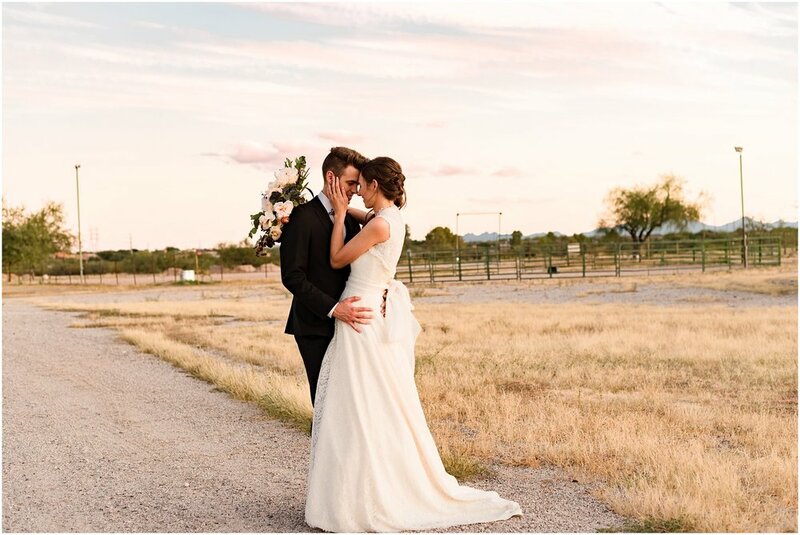 You can see more of her work in my posts "Crumbs Cake Boutique Behind the Scenes," "Desert Boho Styled Shoot," and "Tucson Arizona Wedding." Medella Vina Ranch hosted this shoot. I just loved all the barns and the open garden feel. It is a new venue, so check it out if you're in need of a venue for an event! We also had a couple model as an engaged couple. This couple was far from engaged, however. They've been married for seven years! It was nice seeing a couple still so in love almost a decade down the line. We ended the shoot the horses. I admit, full size horses freak me out just a bit and I kept my distance, but Bordeaux was the sweetest little-big thing. Sweet Obi! I loved this mini horse. His hobbies include being cute and eating grass. I hope you enjoyed this lovely styled shoot! If you're looking for a wedding photographer, I'd love to capture your day!